Paella the way I like it! The best paella I have ever had was from Movida in Melbourne. Movida is a cracker of a Spanish restaurant and a must to visit if you are ever in Melbourne!! Actually it is worth visiting Melbourne just to go to Movida. Like risotto Paella is often made badly in restaurants as it is not terribly difficult to make but is pretty time-consuming, restaurants often cut corners and the result is a rather disappointing dish. I actually really enjoy making paella (when I have time) and I like to go the whole hog and have made my own fish stock which sounds a bit faffy. If you have time it is really worthwhile but not absolutely essential. 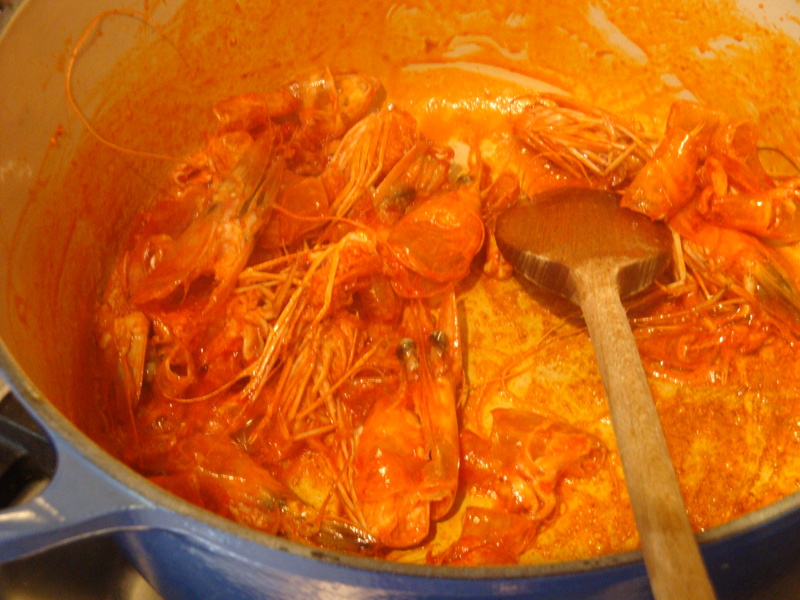 If you do not fancy making a fully fledged fish stock I do recommend you still make the prawn stock – it really makes the dish and is super easy. 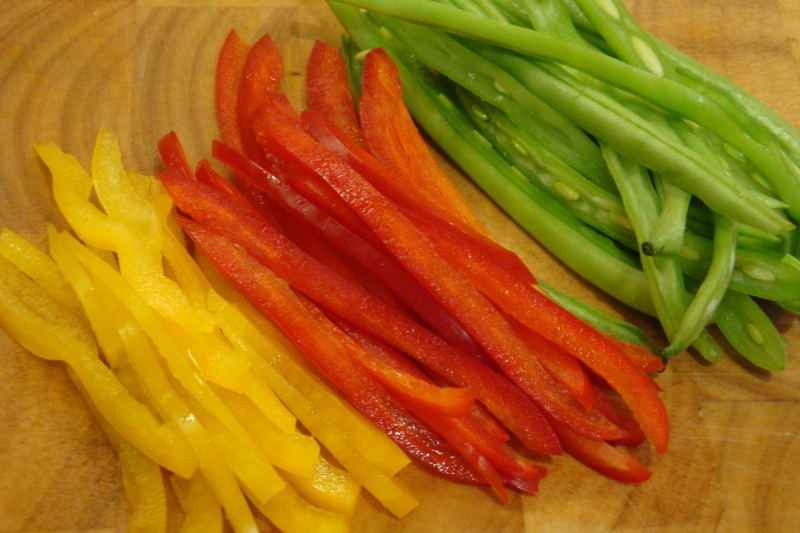 1/2 red pepper (cut into fine slices length wise) I used some yellow pepper too. 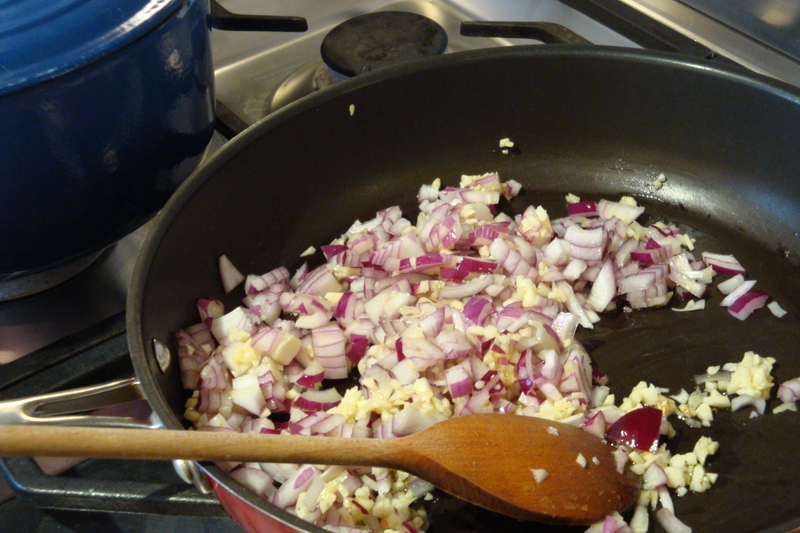 Once the onion and garlic is soft and sweet add in the finely diced red peppers and peeled and diced tomatoes. 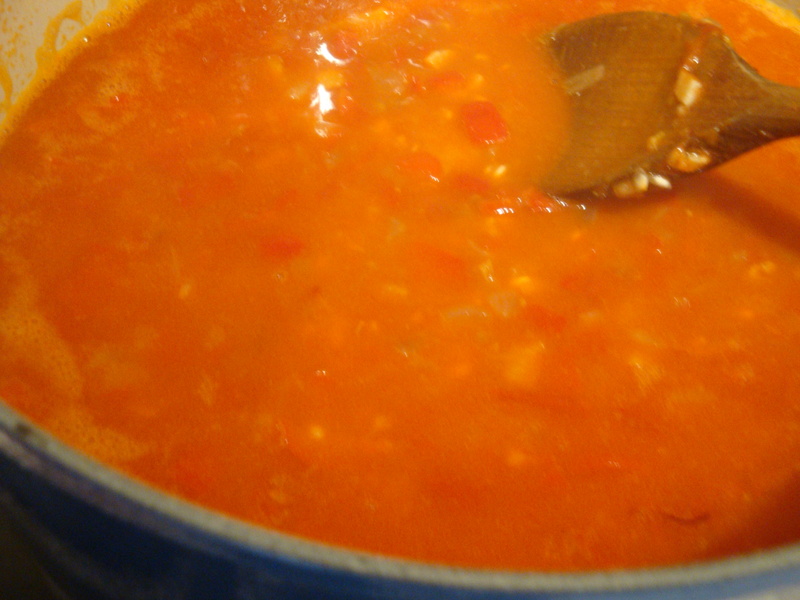 Turn down to a low heat and cook very slowly for about 1 – 1 1/2 hrs until jammy. While this is happening make the fish stock. Roughly chop the carrot, onion and celery sticks and add to a large stock pot. Pop in the parsley stocks, fish bones, peppercorns and bay leaves. Add about 2 ltres of boiling water and bring to the boil. Once boiling reduce to a gentle simmer. 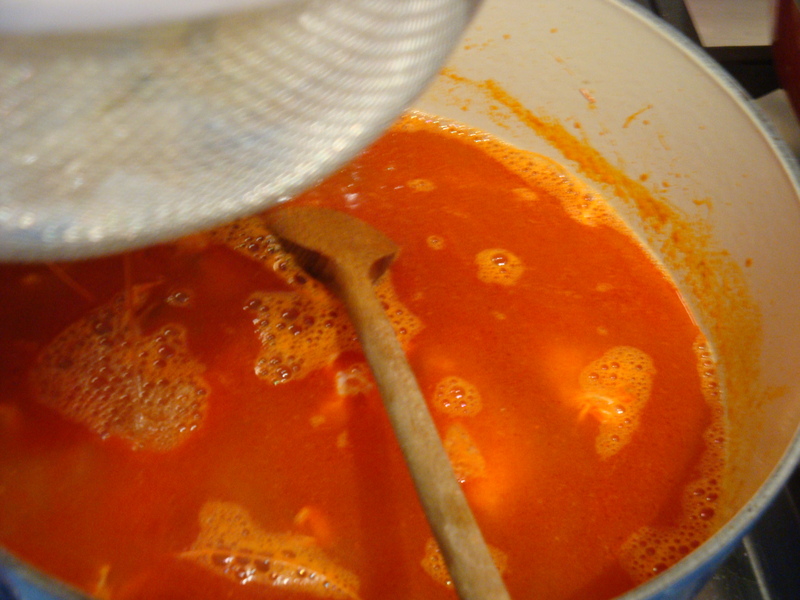 Skim any scum that forms on the top and discard and simmer for about 1 – 1/2 hrs. 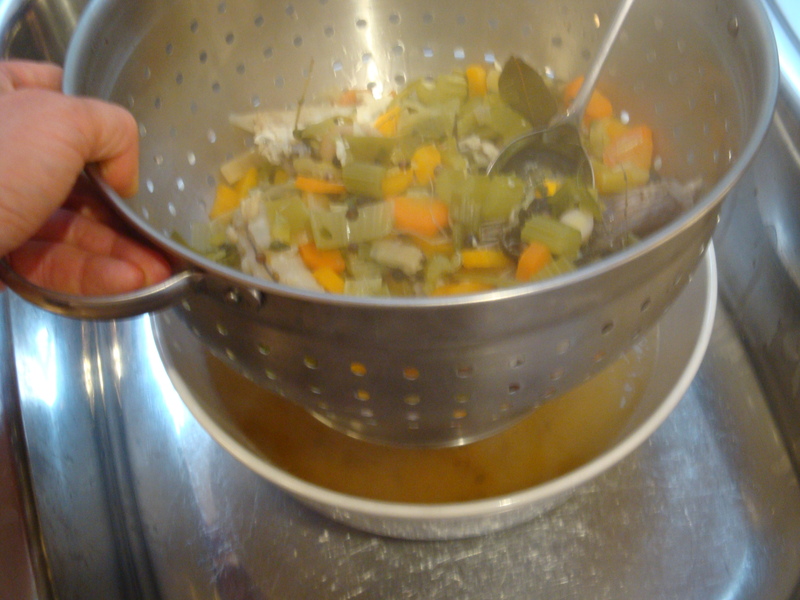 Once the stock has cooked for 1 1/2 hours remove from the heat and strain through a sieve or colander. 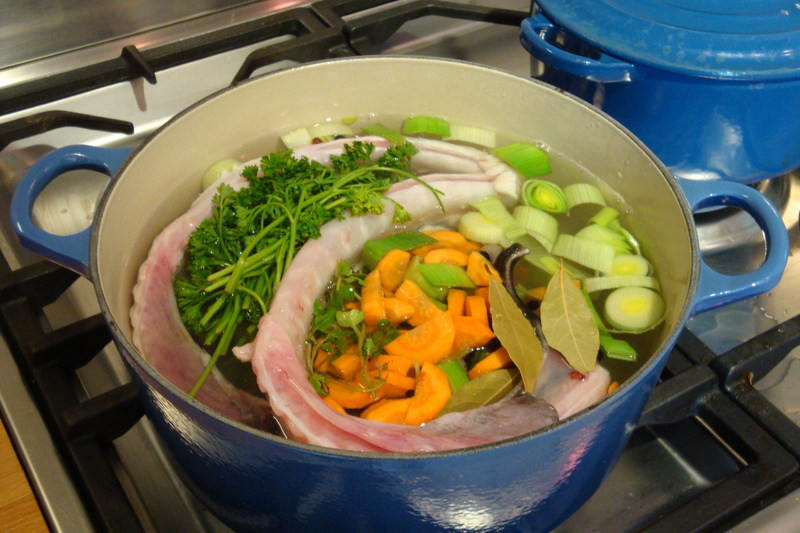 Once you have made the fish stock leave it to the side and make the prawn stock. This is the easiest thing in the world and makes this dish. 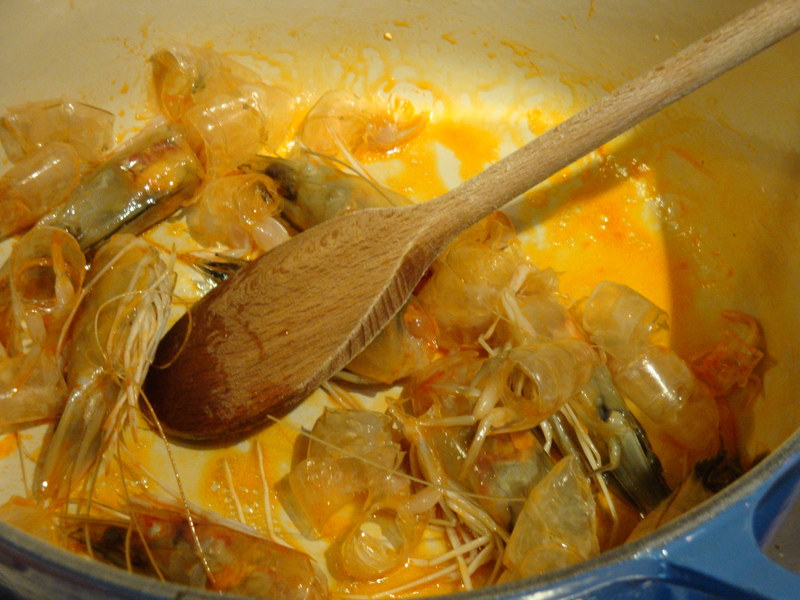 Fry the prawn heads and shells in about 2 tablespoons of olive oil. While they are frying crush the heads with the back of a wooden spoon to get as much flavour out of them. Fry until golden brown then add about 1 ltre of boiling water and simmer for about 15 mins. Once the prawn heads and shells have been boiled strain through a fine sieve pressing the shells to extract as much flavour as possible. Add 1 level teaspoon of smoked paprika and a good pinch of saffron and stir. Leave to the side. Add rice to the cooked soffritto and stir through to combine. 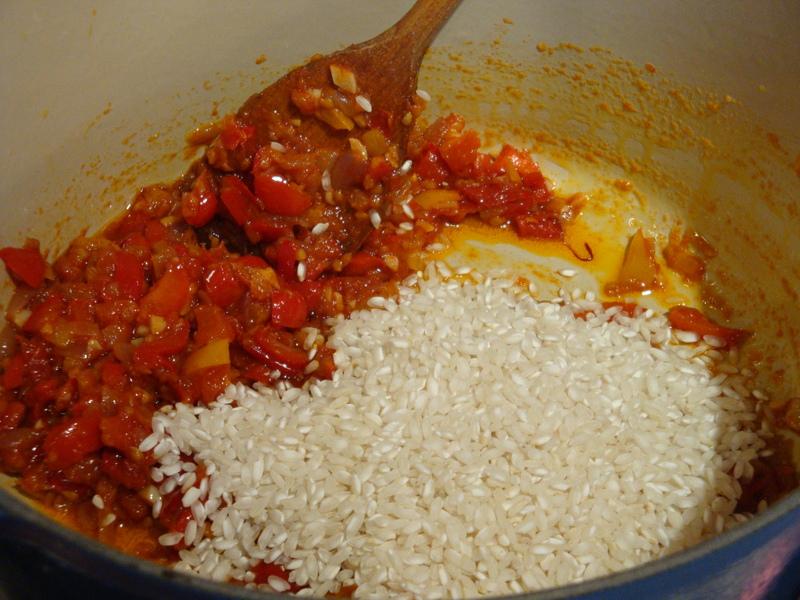 Cook on a medium heat until rice is fully coated in the soffritto. Add in prawn stock and 1/2 of the fish stock. Bring to the boil and reduce to a low simmer. The best kind of pan to use is a deep frying pan and ideally none stick (I even prefer this to a proper paella pan) however I did not have this so used a Le Creuset pot instead. 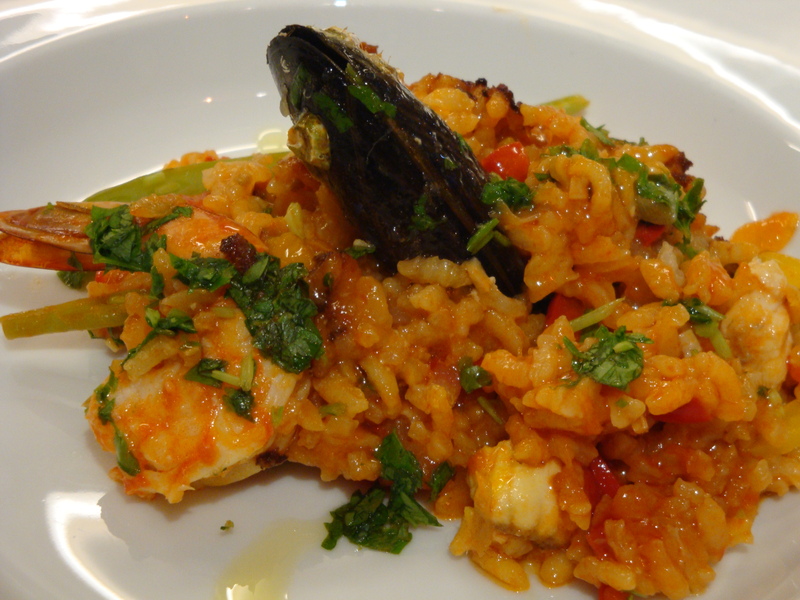 You will need to cook the paella until the rice is almost cooked which will take about 30 mins (still has a bit of a bite to it) you will probably need to add the rest of the fish stock to keep the rice moist but do not add too much as you do not want a wet risotto. If you find that you need more liquid just use boiled water. It is always quite hard to advise exactly how much liquid you will need as it depends on your stove, the rice and the soffritto. 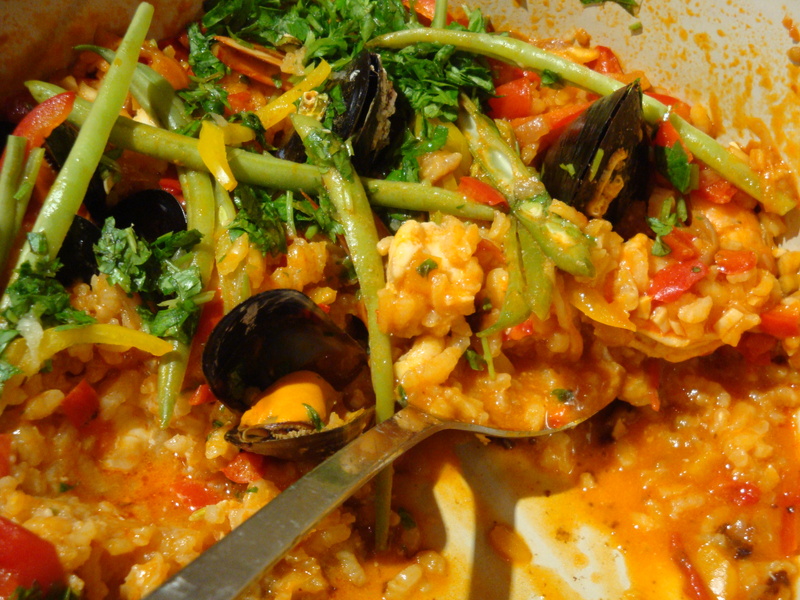 Also try not to stir the paella too much as you do not want the rice to break down and create a tomato risotto. So once the paella rice is “nearly” cooked check for seasoning, add salt and pepper if needed. 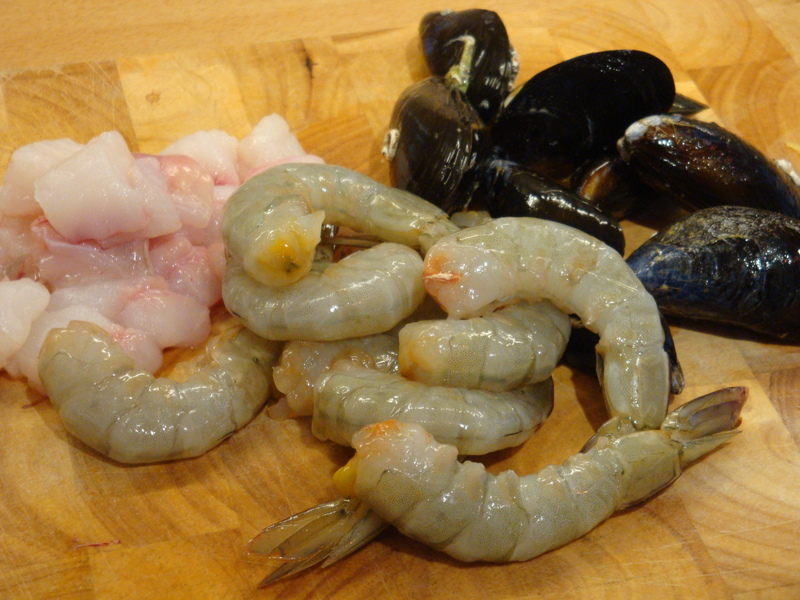 Then pop in 2 cm cubes of white fish, the prawns and the mussels, poke them into the paella rice as far as you can. 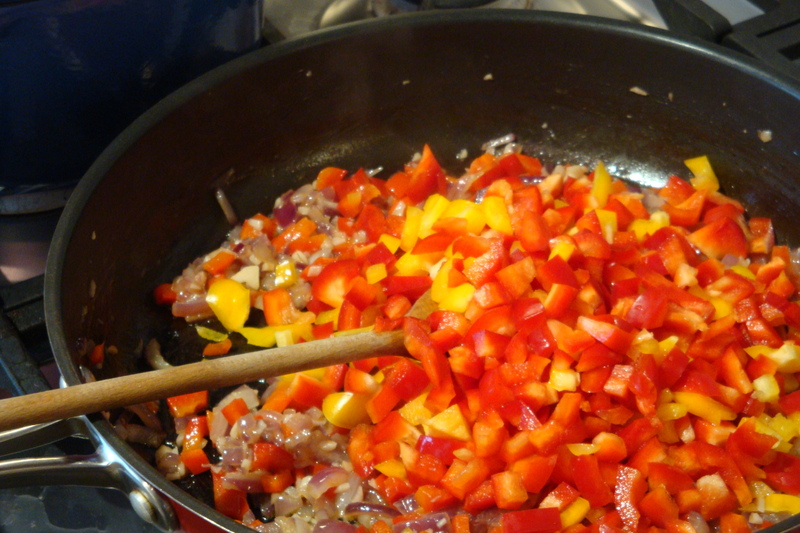 Stir in the peas and add the french beans which have been sliced in half length wise and fine slices of red pepper. Then cover with a lid or tin foil. Let steam the fish/veg steam for about 5 – 8 mins or until cooked. Check the rice to make sure it is also cooked. Sprinkle roughly chopped parsley and squeeze over lemon and serve immediately. I got a bit excited about the imminent eating of paella and forgot to take photos of it when it was finished…opps! Sorry about getting a half eaten pot shot!! It was really fantastic by the way – and I ate way too much as per usual!